The SF90 has now completed its first track outing, following on from last Friday’s launch. 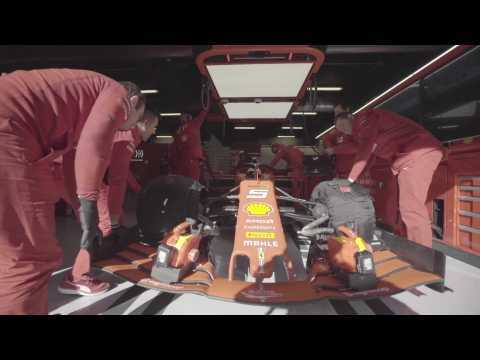 It took place at the Barcelona-Catalunya Circuit, when Scuderia Ferrari Mission Winnow carried out a filming day to gather footage for media purposes for itself and its partners. Kevin Magnussen has played down a wild rumour linking him with Ferrari. Although it seems more likely that Ferrari would replace Kimi Raikkonen with Charles Leclerc, the paddock grapevine said impressive Haas driver Magnussen could also be a contender. Dane Magnussen said he and Haas, the Ferrari ‘B team’, are actually “close” to extending their collaboration for 2019. “I like being at Haas,” he told BT newspaper in Austria. The Ferrari SF90 hit the track for the first time today, at Circuit de Catalunya, as the Scuderia used their allocated filming day to run the new car in with Sebastian Vettel doing the honours first, before handing over to new teammate Charles Leclerc ahead of tomorrow’s first day of Formula 1 preseason testing at the venue.